March is a very exciting month for Registered Dietitian Nutritionists. It’s National Nutrition Month. Party time in the dietetics world! Every year, there is a theme for the month. This year’s theme is Savor the Flavor of Eating Right. The idea is to highlight the importance of enjoying food and all the flavors, traditions, and social experiences involved. Sometimes we get too caught up in what we should and shouldn’t eat, and lose sight of the enjoyment associated with eating. 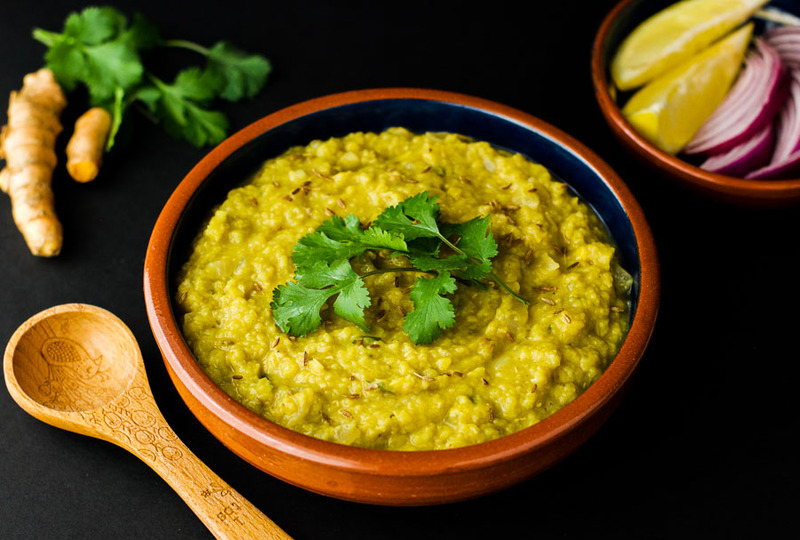 So what better way to celebrate this theme than to enjoy some spicy, flavorful red lentil dal with my sister who is visiting from the UK. I have wanted to try making dal for quite sometime. It is one of the most comforting healthy meals I know of. Thankfully this is one of my sister’s fortes. So she gave me a dal-making masterclass and imparted some of her wisdom on me. Because she cooks with “a spot of this” and “a dash of that”, I translated her method into a bona fide recipe, which I am very excited to share with you all. 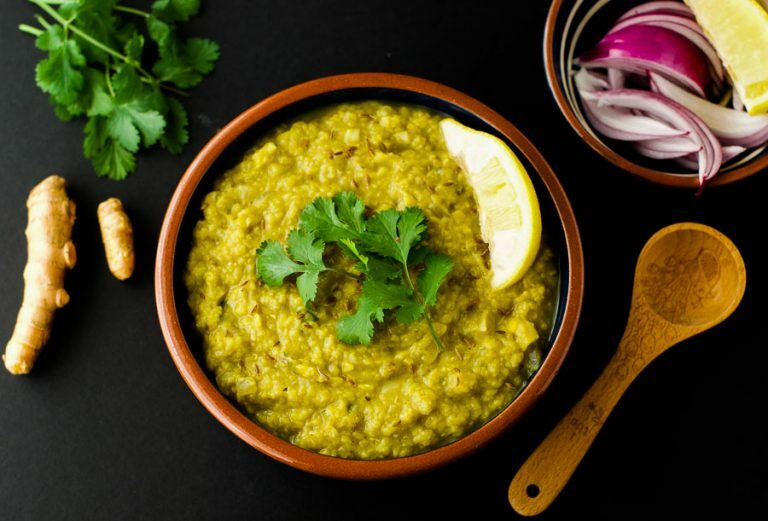 Dal is an Indian dish made from simmered split pulses, often lentils. Lentils are an excellent choice of healthy plant-based protein. Just 1 cup of cooked red lentils contains 18 grams of protein. That is only 2 grams less than a 3-ounce rib eye steak. You also get 16 grams of fiber from that 1 cup of lentils, which is almost 2/3 of the daily fiber requirement for someone eating 2,000 calories a day. In addition, lentils are extremely cheap and very shelf stable, so you can stock up for days when you have no other dinner plan. 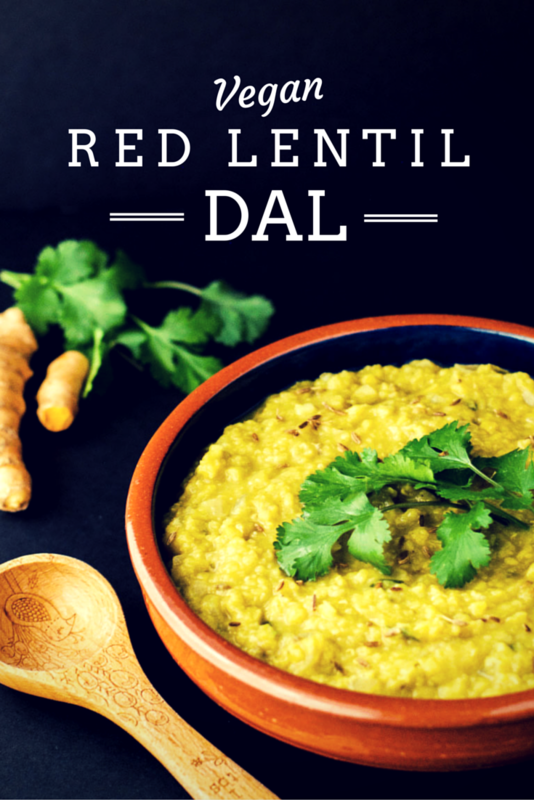 Red lentil dal is an extremely easy and wonderfully healthy way to prepare lentils. It contains turmeric and ginger, both of which are rich in antioxidants. Antioxidants help get rid of the reactive oxygen species that contribute to inflammation in the body. It also contains garlic, which has been shown to lower blood pressure and cholesterol, prevent and reduce the severity of colds and flu, prevent oxidative damage in the body, and even minimize bone loss in women. So without further ado, here is my sister’s recipe for immune boosting, inflammation fighting, red lentil dal. Rinse the lentils in cold water and drain. Put the lentils and water in a pan with the turmeric and ginger slices. Bring to the boil, then turn down to simmer, covered, until they are soft (around 45 mins). The consistency should be like a soupy porridge (oatmeal) once cooked. If it is too thick, you can add some water until it reaches the desired consistency. Meanwhile, heat 1 tbsp coconut oil in pan over a medium heat. Add the cumin seeds, ground cumin, ground coriander, garam masala, and cayenne, and cook for 2 to 3 minutes. Remove from heat and add to the cooked lentils with ¼ tsp salt, or more to taste. Add fresh coriander and serve over a bed of brown rice with a squeeze of fresh lemon. Previous Post: « Can Your Diet Help Prevent Cancer? This looks so good! 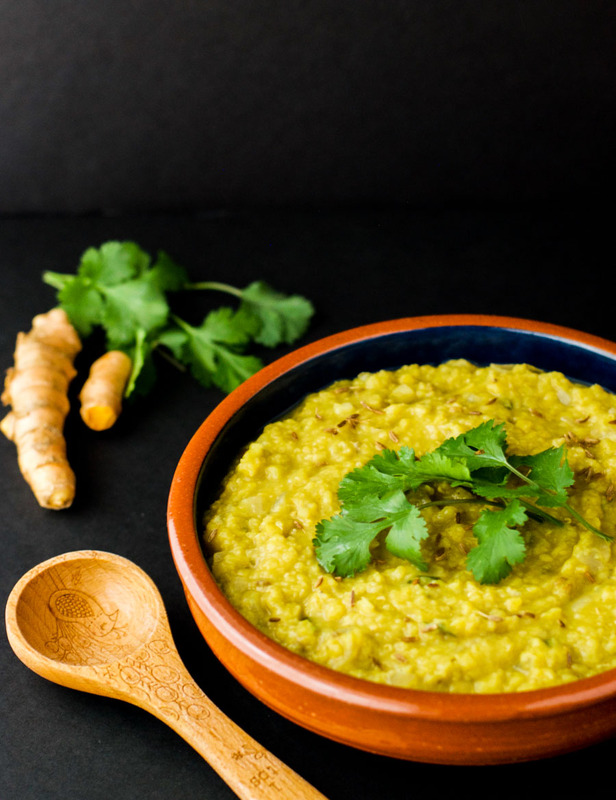 I’ve been wanting to try dal now I have a recipe. Thanks to you and your sister for sharing! You are most welcome. I hope you enjoy it.